Operation Family Secrets is the chilling true story of how the son of the most violent mobster in Chicago made the unprecedented decision to work with the FBI and the U.S. Attorney’s Office to incriminate his own father and to help bring down the last great American crime syndicate—the one-hundred-year-old Chicago Outfit. The Calabrese family of Chicago is a close-knit, middle-class, multi-generational Italian-Irish-American clan. They operate family businesses. They work day and night striving for the American Dream. All three sons forge a bond with their controlling father, Frank Sr., and their soft-spoken favorite uncle, Nick. As a boy, the oldest son, Frank Jr., realizes that his father and uncle are also “made” members of another close-knit family: the outfit. In Operation Family Secrets Frank Calabrese, Jr., tells the turbulent tale of a family dominated by a violent patriarch who breaks a longstanding unwritten outfit code and “brings the street into his home” by enlisting two of his sons into the outfit’s 26th Street/Chinatown crew. Frank Jr. reveals for the first time the outfit’s “made” ceremony and describes being put to work alongside his father and uncle in loan sharking, gambling, labor racketeering, and extortion, and plotting the slaying of a fellow gangster, while they commit the bombing murder of a trucking executive, the gangland execution of two mobsters whose burial in an Indiana cornfield was reenacted in Martin Scorsese’s blockbuster film Casino, and numerous other hits. The Calabrese Crew’s colossal earnings and extreme ruthlessness make them both a dreaded criminal gang and the object of an intense FBi inquiry. Eventually Frank Jr., his father, and Uncle Nick are convicted on racketeering violations, and “Junior” and “Senior” are sent to the same federal penitentiary in Michigan. Upon arrival, Frank Jr. makes a life-changing decision: to go straight rather than agree to his father’s plans to resume crew activities after serving his sentence. But he needs to keep his father behind bars in order to regain control of his life and save his family. Frank Jr. makes a secret deal with prosecutors, and for six months—unmonitored and unprotected—he wears a wire as his father recounts decades of hideous crimes. 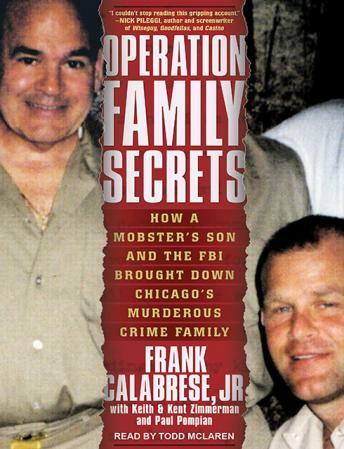 Frank Jr.’s cooperation with the FBi for virtually no monetary gain or special privileges helps create the government’s “operation Family Secrets” campaign against the Chicago outfit. The case reopens eighteen unsolved murders and also implicates twelve La Cosa Nostra soldiers and two outfit bosses. it becomes one of the largest organized crime cases in U.S. history. Operation Family Secrets intimately portrays how organized crime rots a family from the inside out while detailing Frank Jr.’s deadly prison-yard mission, the FBI’s landmark investigation, and the U.S. attorney’s office’s daring prosecution of america’s most dangerous criminal organization.